„Известия на Исторически музей-Поморие“ приема статии и научни съобщения за своя юбилеен втори том до 30 септември 2015 г. After a prolonged vacation due to some technical problems the website PREHODBG.COM which is dedicated to Bulgarian Transition is finally back online. A new phototype edition of the book "The Personal Regime in Bulgaria" (Publihisng House "Iztok-Zapad") by the Bulgarian politician and writer Todor G. Vlaykov is published. The edition begins with an introduction by Prof. Georgi Bliznashki who teaches constitutional law at the University of Sofia and is a former politician. The book was released on 12 July - the day of the current Bulgarian constitution. 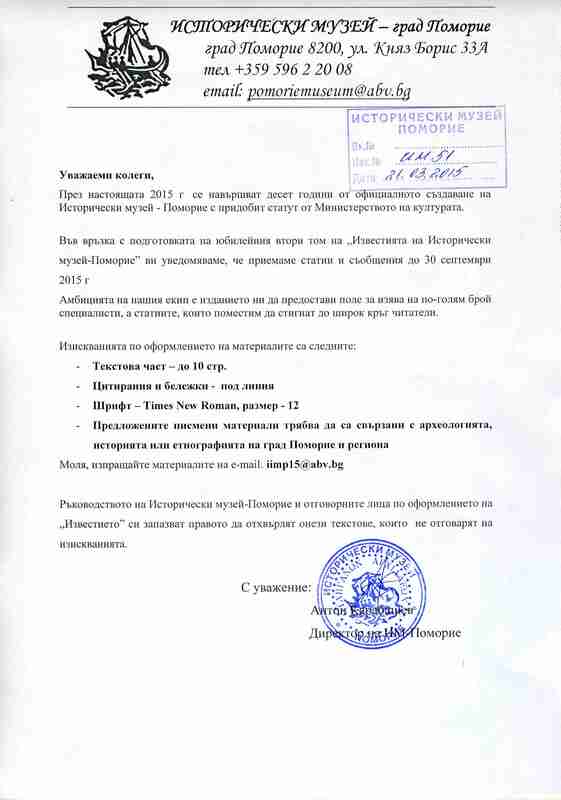 Bulgarian State Agency for National Security has released former secret documents regarding its operation called "Gallery" which has been aimed at eavesdropping of some Bulgarian journalist, businessmen, politicians as well as its own agents in 2008. In front of Vasil Levski's monument in the center the town of Pleven in Northern Bulgaria tonight will be officially launched National tour "In the footsteps of the Apostle", dedicated to the memory of Bulgaria's "top"